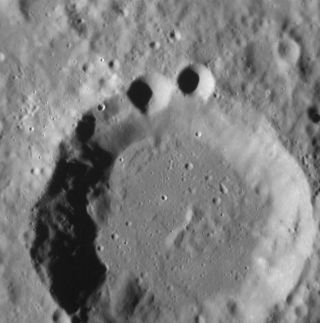 Craters photographed by MESSENGER spacecraft may appear to resemble a familiar television character, a favorite of children. Image acquired August 29, 2012. An impact basin spotted on Mercury with two smaller craters above it looks remarkably like the sweet treat-loving Cookie Monster muppet of "Sesame Street" fame — at least to the eyes of scientists working on NASA's Messenger mission to the small planet. The researchers posted a photo of the crater arrangement with the title "Anyone Else Think This Looks Like the Cookie Monster?" on the Flickr page of NASA's Goddard Space Flight Center in Greenbelt, Md., today (Oct. 12). The charming crater is a giant circle created when a space rock impacted planet Mercury long ago. Two smaller craters dot the upper edge of the main impact site, and were created when lesser asteroids smashed into the planet after the larger strike.